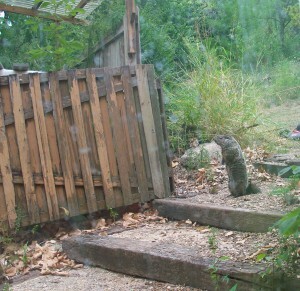 Today I’m celebrating our very large ground-dwelling critter who munches our compost. Thanks to Disney’s Bambi II, when little rabbits jump up and down singing “groundhog, groundhog!” I’m very fond of groundhogs. Here are a few pictures Ryan took of the groundhog living in our neighbor’s backyard. 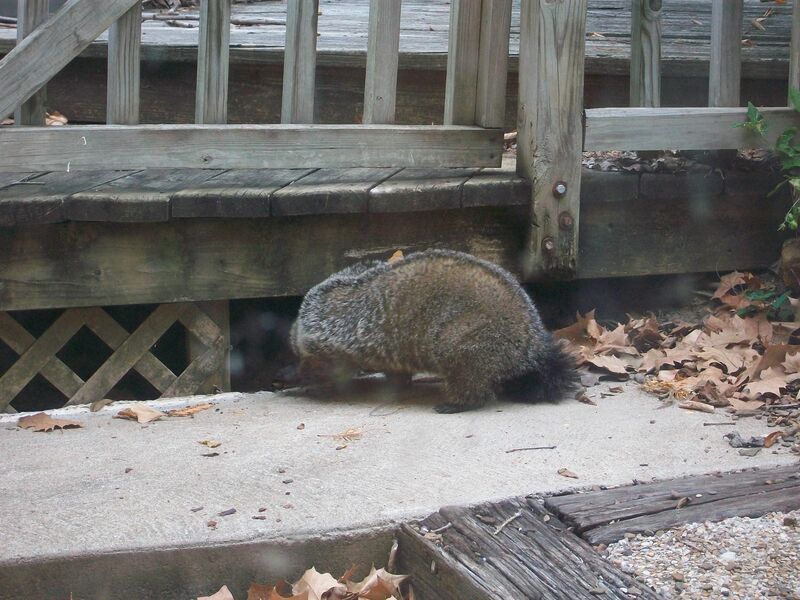 In the photos, the groundhog is actually directly across from our front door! Isn’t that cool?! 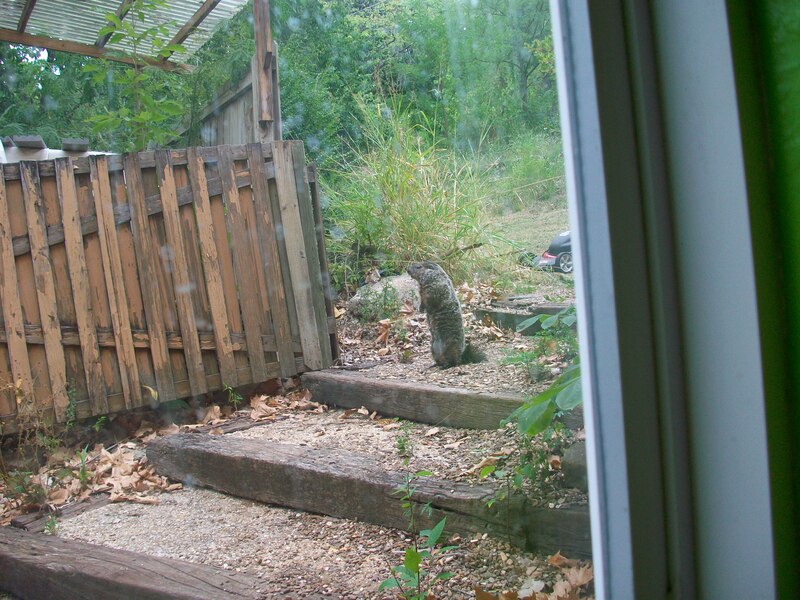 We were inside the house looking out the window when I saw what looked like a large prairie dog standing upright. Upon realizing it was the groundhog, Ryan grabbed the camera and we watched it for several minutes. It stood at the top step like a statue, checking for danger. Waddling down a few steps, the groundhog bunched itself up, as though it were saying “This is my step! I am a big mean bucktoothed fluffy thing so don’t mess with me!” Dragging a tail like a chimneysweep’s broom, it reached the edge of the deck and paused just under the broken gate. Munch nibble pause. It chewed the air, black eyes glistening and alert. Then it disappeared into the darkness of the musty leaf litter below the deck. Meanwhile, the cats, Ryan and I were all scrunched around the stairs straining to look out the window. I held my breath, feeling like I was facing a bear. A very small bear, but mysterious and cute. What’s it like to live underground and be that furry? I wondered. The groundhog looked at me, right through the window, and I’m pretty certain it saw us. The world stopped moving for a moment. The rest of life wasn’t important – not dinner, chores or my piles of work; a groundhog was watching me. Afterwards, I wanted to know whether it was a groundhog or a gopher or something else. According to Wiki Answers, there’s quite a difference between a gopher and a groundhog. 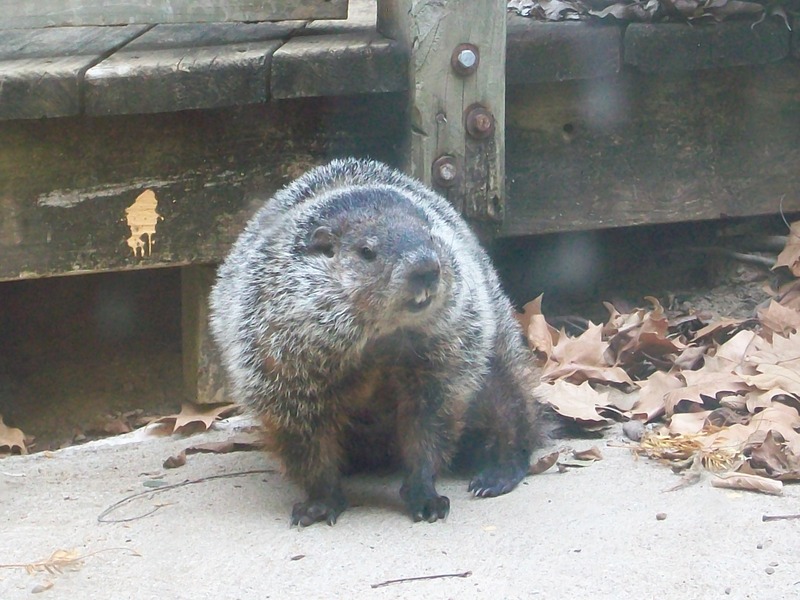 Groundhogs are larger and often come above ground, and they can be aggressive. Gophers are small and spend most of their time underground in burrows, like moles. 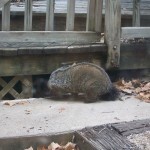 It’s so amazing we have this groundhog 5 steps away from our front door! We’re so lucky.